Cameron Seip of the Blue Stars (2002-2003) sent this one in: "There are few things I have in common with my brother. One of those things is that fact that we both love music. Ever since I was little, before I got started in instrumental music, he and I didn't get along very well. He was always listening to the radio, or reading, or something else being very serious, and I was playing with my friends. "Our personalities were totally different. But when I started music, and became better, so did our relationship. The reason I marched was to get to know my brother better, and strengthen our relationship. 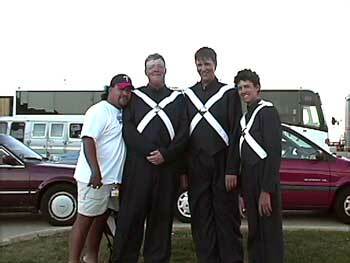 The last show of his junior corps experience, I can remember coming off the field after finals in Orlando, and I hugged him, and thanked him for letting me tag along. He replied with something I will never forget. "I am glad you got to experience what I feel." I will never forget those seasons of two of the greatest summers of my life. This picture includes my brother and I (middle), and our brass caption head Ray Vasquez (left), and my partner in crime Tyler Anthony (right)."